Cranberry Clafoutis, Thyme for Cooking easy holiday dessert. 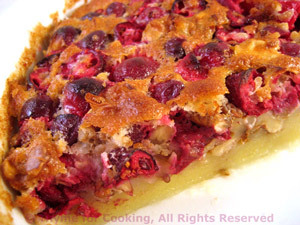 A clafoutis is a simple batter, poured over fruit. Very easy! Cut the cranberries in half. Butter a glass baking dish, quiche pan or deep pie plate, (or even a round metal cake pan) 10 in. (25cm) in diameter. Take 1 tbs of the sugar and sprinkle it over the butter, shaking the dish to distribute evenly. Combine the cranberries and walnuts and spread in dish. Whisk the eggs until they turn lighter in color, about 5 minutes. Add the flour and whisk well. Add the milk and vanilla. Whisk until smooth. Pour the batter over the cranberries and bake, 425F (210C) 30-35 minutes. It should have a lovely brown crust and be set in the middle. Let sit 10 - 15 minutes before slicing and serving. Serve warm or at room temperature.